The Prayer of the Three Holy Children is a component of the biblical Book of Daniel. It is a segment of a larger component called The Prayer of Azariah and the Prayer of the Three Holy Children which. although part of the Septuagint text, is considered by Protestants as part of the Apocrypha rather than a fully canonical part of Scripture, and so appears in most English-language bibles as a seperate section. If included within the larger text of Daniel, it would appear in the third chapter of between verses 23 and 24. In Orthodox Christian worship, the prayer is the basis of the seventh and eighth biblical canticles sung at Orthros. Although the text of the canticles are generally not read in contemporary practice, the hymns sung as part of the canon reference the theme of the Three Holy Children. At Vespers of Holy Saturday, the text of the prayer is heard as part of one of the fifteen Old Testament readings prescribed for that day. In Byzantine practice, the closing refrains to each verse "bless ye the Lord: praise and exalt him above all for ever" are chanted elaborately. The song constitutes a hymn of thanksgiving to God for deliverence from the fiery furnace into which the three young men, Ananias, Azarias and Misael (also known as Shadrach, Meshach and Abednego) had been cast by the Persian king Nebuchadnezzar. They were cast into the furnace for refusing to worship a golden idol that Nebuchadnezzar had created. 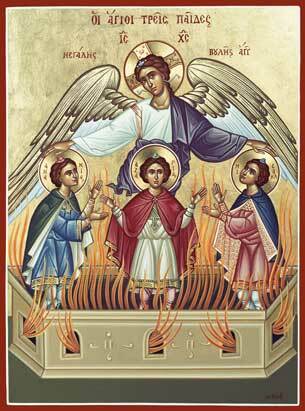 However, an Angel of the Lord entered the furnace and protected the three young men. In liturgical practice, the event is seen to presage the Resurrection of Christ, thus its inclusion in the canon. The Abingdon Bible Handbook (ISBN 0687001692) suggests that the Prayer was based on an earlier composition and was added to the existing text of Daniel sometime in the second or first century B.C. The Roman Catholic Church considers this text to be part of the deuterocanonical collection which was defined at the Council of Trent in 1546 as "sacred" and "canonical." The Book of Common Prayer of the Church of England includes the text as the canticle Benedicite omnia Opera. For thou art righteous in all the things that thou hast done to us: yea, true are all thy works, thy ways are right, and all thy judgments truth. In all the things that thou hast brought upon us, and upon the holy city of our fathers, even Jerusalem, thou hast executed true judgment: for according to truth and judgment didst thou bring all these things upon us because of our sins. For we have sinned and committed iniquity, departing from thee. In all things have we trespassed, and not obeyed thy commandments, nor kept them, neither done as thou hast commanded us, that it might go well with us. Wherefore all that thou hast brought upon us, and every thing that thou hast done to us, thou hast done in true judgment. And now we cannot open our mouths, we are become a shame and reproach to thy servants; and to them that worship thee. To whom thou hast spoken and promised, that thou wouldest multiply their seed as the stars of heaven, and as the sand that lieth upon the seashore. For we, O Lord, are become less than any nation, and be kept under this day in all the world because of our sins. Neither is there at this time prince, or prophet, or leader, or burnt offering, or sacrifice, or oblation, or incense, or place to sacrifice before thee, and to find mercy. Nevertheless in a contrite heart and an humble spirit let us be accepted. Like as in the burnt offerings of rams and bullocks, and like as in ten thousands of fat lambs: so let our sacrifice be in thy sight this day, and grant that we may wholly go after thee: for they shall not be confounded that put their trust in thee. And now we follow thee with all our heart, we fear thee, and seek thy face. Put us not to shame: but deal with us after thy lovingkindness, and according to the multitude of thy mercies. And let them know that thou art God, the only God, and glorious over the whole world. So that the flame streamed forth above the furnace forty and nine cubits. And it passed through, and burned those Chaldeans it found about the furnace. And made the midst of the furnace as it had been a moist whistling wind, so that the fire touched them not at all, neither hurt nor troubled them. Blessed art thou, O Lord God of our fathers: and to be praised and exalted above all for ever. And blessed is thy glorious and holy name: and to be praised and exalted above all for ever. Blessed art thou in the temple of thine holy glory: and to be praised and glorified above all for ever. Blessed art thou that beholdest the depths, and sittest upon the cherubims: and to be praised and exalted above all for ever. Blessed art thou on the glorious throne of thy kingdom: and to be praised and glorified above all for ever. Blessed art thou in the firmament of heaven: and above ail to be praised and glorified for ever. O Ananias, Azarias, and Misael, bless ye the Lord: praise and exalt him above all for ever: far he hath delivered us from hell, and saved us from the hand of death, and delivered us out of the midst of the furnace and burning flame: even out of the midst of the fire hath he delivered us. en.wikipedia.org - The originl article. This page was last edited on October 27, 2008, at 00:23.